Cornell University Law School studied Delaware’s death penalty during its modern era from 1977 to 2012. The study is independent, current, and rigorously researched. The findings show that Delaware’s death penalty process is applied unfairly. “Black defendants who kill white victims are more than six times as likely to receive the death penalty as are black defendants who kill black victims (186.7 per thousand as compared to 28.5 per thousand). Moreover, black defendants who kill white victims are more than three times as likely to be sentenced to death as are white defendants who kill white victims (186.7 per thousand as compared to 52.0 per thousand). Interestingly, white defendants who kill white victims are about as likely to receive a death sentence as white defendants who kill black victims (52.0 per thousand as compared to 48.8 per thousand). 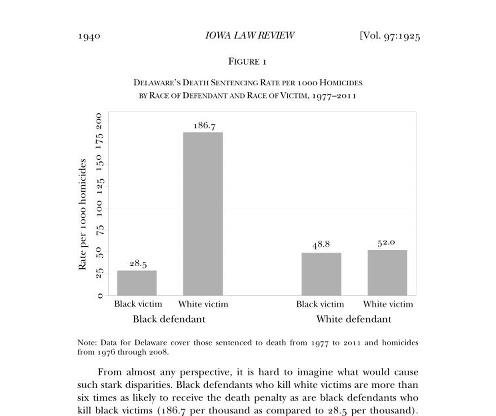 The rate that stands out, however, is the rate for black defendants who kill white victims” (p. 1940). Page 1941 – Even when compared to Southern states, the Delaware death sentencing rate for black defendants with white victims is extremely high; it is 75% higher than the closest contenders, Georgia and Nevada, more than twice as high as that of South Carolina and Virginia, and more than three times as high as that of its near neighbors, Maryland and Pennsylvania.